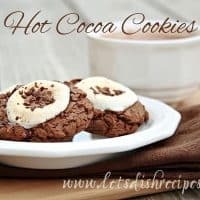 I know spring is right around the corner, but it’s been hot cocoa weather around here, so I didn’t want to put off making these Hot Cocoa Cookies any longer. They were fabulous! In fact, I recommend making them any time of year. The original recipe called for all semi-sweet chocolate, but I think the milk chocolate definitely adds to the hot cocoa flavor. And really, how can you go wrong with chocolate and marshmallows? These are still tasty when cooled completely (I ate quite a few that way), but they are meant to be eaten warm, while the chocolate and marshmallow is still melty and gooey. Just pop them in the microwave for 10 seconds or so once they’ve cooled to return them to a fresh-from-the-oven state. In a medium saucepan over low heat, melt butter and 12 ounces semi-sweet chocolate. Stir frequently until smooth. Let cool for 15 minutes. In a medium bowl, whisk together flour, cocoa, baking powder and salt. With an electric mixer, beat the brown sugar, eggs and vanilla on low speed until smooth, 2 minutes. Mix in the cooled chocolate mixture just until blended. Add the flour mixture in 2 batches, mixing on low speed until just combined. Using a tablespoon, scoop the dough and roll into 1-inch balls. Arrange cookies 2 inches apart on prepared sheets, flattening slightly with the palm of your hand. Bake until the tops of the cookies crack, about 7-8 minutes. Meanwhile, cut the Hershey bars into 1-inch squares, saving some chocolate to grate over the finished cookies. Snip the marshmallows in half crosswise and stick 1 square of chocolate onto each of the cut sides. 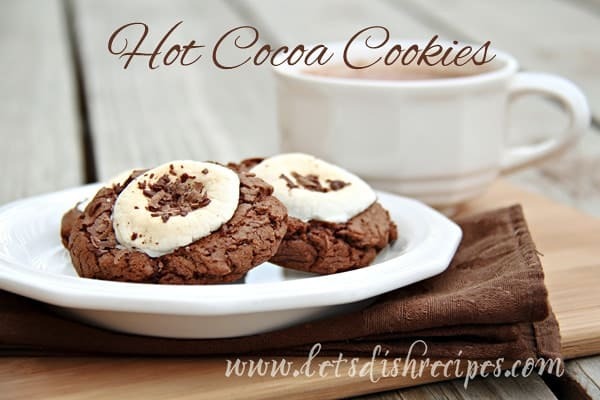 Remove the cookies from the oven and gently press a marshmallow half, chocolate side down, into each cookie. Return to oven and bake until the marshmallows are just softened, about 4 minutes. Cool on pans for 5 minutes before transferring to wire racks to cool completely. Grate additional chocolate over cookies to garnish. Who Dished It Up First: Adapted from Pip & Ebby. Yum, I love the addition of the toasted marshmallow on top. nothing beats warm cookies that tastes like they’re just fresh from the oven! I always microwave my cookies too! haha..